Green with envy. Seeing red. Feeling blue. Sound familiar? These frequently used expressions illustrate how powerfully color relates to our emotions. It has the potential to calm, enliven, soothe and even irritate. Considering the black shadow cast by the dire economy, it’s no wonder that color trend forecasters are predicting a stand out year for vivid, feel-good hues. 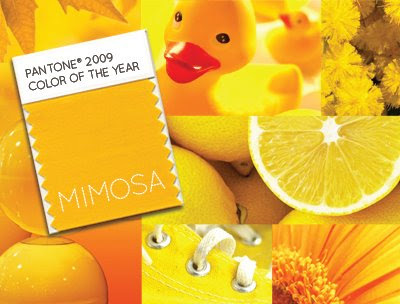 Pantone®, the global authority on color, selected Mimosa as the color of the year for 2009. The inviting, golden yellow is an energizing symbol of optimism and hope in times of economic uncertainty. Mimosa reflects “the warmth and nurturing qualities of the sun, properties we humans are drawn to for reassurance,” says Leatrice Eiseman, director of the Pantone Color Institute® in Seattle. Yellow is thought to spark imagination and innovation, making it a perfect choice for a halted economy in need of bright ideas to spark recovery. Our new First Lady was right on target with her choice of a pale gold dress during this year’s historic inauguration. 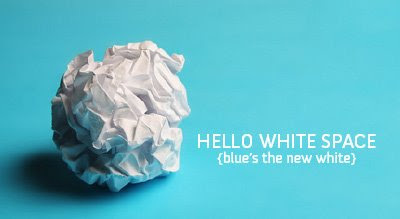 Pantone’s® 2009 spring and summer fashion trends also favor an increased chroma of color, moderated by grounded, neutral tones that address the need for stability. Purple advanced to the fashion forefront in late 2008, and continues to evolve this year. Lavender conveys a sense of creativity, refinement and calm. A fresh spectrum of bright greens perpetuates the idea of renewal and rebirth. Salmon Rose and Super Lemon bring a cheerful, positive outlook, while Fuchsia Red adds an air of everyday elegance. Color trends traditionally debut in the fashion industry, but this adventurous use of hue is popping up in the most unexpected of places. Large corporations are welcoming vibrant color in their identities, and are replacing traditional business palettes with radiant tints supported by stable, sophisticated neutrals. Business may be slow, but it certainly doesn’t have to be dull. Looking forward, Pantone’s® fall palette for this year offers much of the same uplifting vibrancy, but with a slightly subdued tone. The hopeful yellows, purples and greens of summer are carried through with richer shades that add surprising flair when paired with some of the classic neutrals of the season. 1 DON’T share your fonts with others. 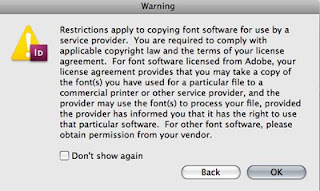 Fonts are not shareware and by purchasing or downloading a font you agree to their respective licensing agreements. This includes not posting a font to newsgroups, on a FTP sites, or copying to CD/DVD for distribution purposes. The one exception to this rule is in the event that you provide a service printer with the collected files for a job that you are having printed. 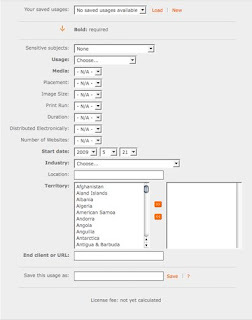 Design programs run a job collect action on a file and this includes collecting all fonts used in the document. The printer needs these fonts in order to print the job. When the program runs the collect action it will warn the user of restrictions and to comply with copyright law as well as the terms under the agreement. Here is an example of what that warning looks like. 2 DON’T relinquish stock images to a client unless they were purchased on their behalf. Much like a font, stock images are not shareware. By purchasing a stock image you have agreed to the licensing agreements for that image and that agreement is between you and the stock house. If the client wants to own the image for their use, they must either purchase it themselves or you may do so on their behalf. 3 DON’T assume that a stock image is royalty free. When purchasing an image from an online stock house, be sure to read ALL the information on the image’s page. That image may be rights managed. This means you have to acquire a licensing agreement in addition to paying a determined fee. How much that fee will be is all dependant on: usage, placement, image size, print run, duration, website usage, electronic distribution, location and industry. It is your responsibility to be accurate when supplying all this information. Failure to do so, may lead to serious legal and/or financial consequences. Here is an example of what a fee calculator form looks like. This one is from the online stock house, www.veer.com. 5 DON’T just think it’s famous faces. Characters and cartoons from movies and TV and/or the likeness of them, usage of their names, and even the usage of an average, everyday person, are protected under the copyright law. You must acquire permission from a person(s) and/or their agency and likely pay a usage fee. 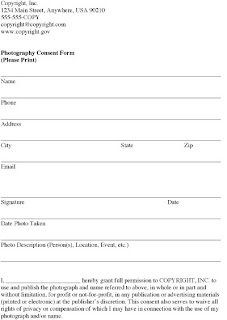 In the case of using a photo of an average everyday person, it’s in your best interest to have the person(s) sign a photo consent form. Make sure your consent form is quite clear on the intent and usage. Here is a sample of what a general consent form may look like. 6 DON’T assume an image is in the public domain. As you’ve now learned, if you want to use a photo of someone famous in an ad campaign to sell your product and/or service, you’re going to have to ask his/her agency’s permission, get a licensing agreement and pay handsomely for it. But is that person alive, or are they deceased for less then 70 years? After the Copyright Term Extension Act in 1998, an additional 20 years was added to the copyright law. Copyright protection availability extended for the life of the author, plus 50 years. With the additional 20 years, it makes it a total of life plus 70 years. If the work is of corporation authorship or other entity, the term is 75 years plus the additional 20 years. Beyond this period, the image becomes public domain. Under this Extension Act, original works made in or after 1923 that still hold their copyright in 1998 will not enter the public domain until 2019 or later. COPYRIGHT is a small, inconspicuous symbol that packs a big punch – one that can put you into a financial knockout. Owners have the right, by federal and international law, to protect their published or unpublished original works of authorship against unauthorized usage. Anyone who breaches these rights can be held liable. Lawsuits, fines, loss of intellectual property, and in some cases, criminal action such as imprisonment can incur. There are five specific rights that a copyright holder is entitled to: reproduction, modification, publication, performance, and public display of the work. Understanding copyright basics is fundamental for anyone who is involved in “creating, licensing, selling, or buying creative products.”* For anyone interested in knowing all there is to know about the different facets of copyright can read all thirteen chapters contained in Title 17 of the United States Code. And for those that have a little less time on their hands, here are some copyright basics. What does the term “original works of authorship” mean? How does my work become copyrighted? The work is copyrighted the moment it is created and “fixed in any tangible medium of expression, now known or later developed, from which they can be perceived, reproduced, or otherwise communicated, either directly or with the aid of a machine or device.”** If you wish, you can take it a step further and register your original work. How do I note copyright in my work? 3. the name of the owner of copyright or an abbreviation that is generally recognized. For further information and details on the notice of copyright, please refer to Chapter 4 of Title 17. How do I register my work to be copyrighted? Registering your work is completely voluntary. 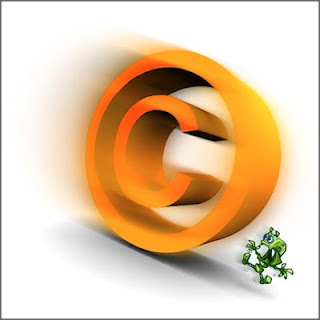 Failure to register your original work will subject you to limitations of copyright law and in the event of infringement, it may cost you attorney fee recovery as well as loss of statutory damages. The only time you are required to register is if your work’s rights have been violated and you wish to file a lawsuit. You can register your original work online at http://www.copyright.gov/register/index.html. Or you may visit the Copyright Office located in Washington DC. What if I want to use an original work for my own usage, how do I go about getting permission and/or a licensing agreement? First check to see if the work has been registered with the Copyright Office. There you will be able to find the author’s name. If it hasn’t been registered, you will have a bit of leg work to do, but likely the source where you found the work will either list the author or it will be obvious. Contact the author for permission and if a licensing agreement is required, be specific on the terms of usage, such as: where, when, how, and the quantity of the usage. Keep in mind, registered works prior to 1978 can only be found in the Copyright Public Records Reading Room. Is there a difference between copyright and trademarks and patents? As you have now learned, copyright protects original works of authorship. Whereas a trademark protects logos, images, symbols, phrases, words or designs identifying a service or goods from one party and that differentiates themselves from competitors. And a patent protects discoveries and inventions. 1 DON’T hide your message with a lot of words–when only a few will work. 2 DON’T forget that negative space is a shape too. 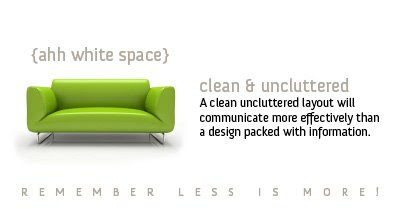 3 DON’T overwhelm a viewer with a lot of clutter–space can be a key to comprehension. 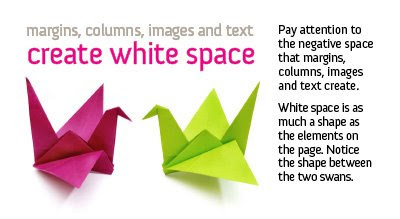 4 DON’T lose sight of your message–use negative space to guide your viewers eyes to the key elements of your design. 5 DON’T forget that what is left off of a page can speak louder than what isn’t. Close situations cause irritation. Take for example, standing in line at the post office. We’ve all had a person standing behind us so close that there is no question they had tuna for lunch. That lack of personal space can be irritating. Design is no different. Not enough space in a layout can be smelly, or at least irritating. Irritation leads to loss of attention. The quickest way to lose an audience is to overwhelm them. Cluttered layouts tire the eye, hinder clarity and overall irritate the viewer. Worst of all, the message is lost when the viewer simply loses interest. 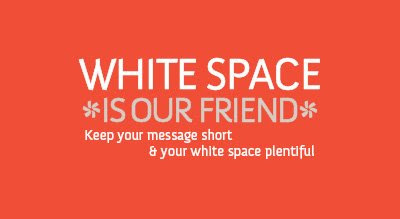 Padding your message with space gives the eyes a place to rest and will help you to avoid drowning your viewer with too much information. 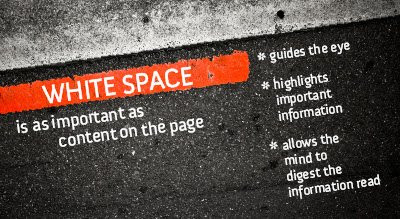 Use negative space, often called white space, to guide the eye around the page and put emphasis on important information. A little planning, a bit of a concept and nice use of negative space will help get your message noticed, read and most importantly, remembered. Less is more. Don’t forget, first-class postal rates increased to 44 cents yesterday! 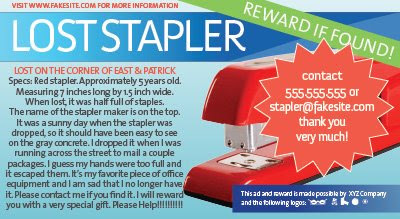 As of March 29, 2009 addressing requirement on flat mail (large envelopes, catalogs) has changed. Make sure your designs are compliant. Download the pdf. While all this is kind a downer, check out some fun facts on the United States Postal Service. Most Unusual Delivery Method — mule trains in Arizona. Each mule carries about 130 pounds of mail, food, supplies and furniture down the 8-mile trail to the Havasupai Indians, averaging 41,000 pounds per week. 1 DON’T use more than 2 or 3 fonts per project. 2 DON’T use all-italics or all script/cursive fonts in big blocks of text, like an invitation. 3 DON’T use more than 4 different sizes of type in your project: (1) Header, (2) Subhead, (3) Body Text, and (4) Caption/Footnote. 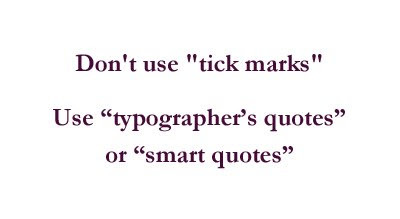 4 DON’T use tick marks as apostrophes or quotation marks. 5 DON’T use all-caps as body text. 6 DON’T stretch or squish your text. 7 DON’T put double spaces between your sentences. 8 DON’T allow a line of body text to exceed 5 inches in width. 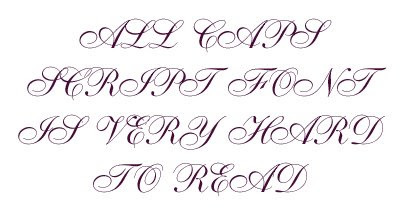 9 DON’T use a decorative script font in ALL CAPS. 10 DON’T use center-aligned headers or subheads with left or right aligned body text. What distinguishes good design from great design? Typography. While typography is a complex art, that has evolved over the ages, by using these simple tips, your designs can achieve greatness. A good rule of thumb, when setting text, is that 10 pt type is a good, basic size for a large body of text. Anything below 9 pt can become hard to read, and anything above 11 pt can look elementary, like a children’s book. 16 to 20 pt type works well for headlines, and 12 to 14 pt is appropriate for subheads. Captions and footnotes can be much smaller at 7 to 9 pt. When it comes to size, keep it simple – only use 4 different sizes of type: (1) Header, (2) Subhead, (3) Body Text, and (4) Caption/Footnote. Set the proper mood by using a carefully selected font. A “serif” font (like Times) is best for setting a long body of text. “Serifs” are the little feet at the ends of each letter. They tend to portray a traditional look. In contrast, “sans-serif” fonts (like Helvetica or Arial) don’t have serifs. Sans-serif fonts are more modern and basic. 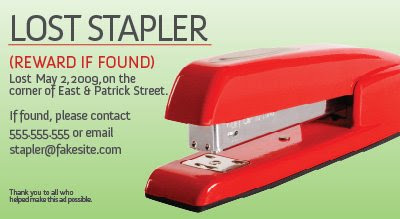 They are great for headlines or short stretches of text in a poster or small advertisement. Most importantly, the font you use should be appropriate to the subject matter. If you find yourself limited to fonts that came with your computer, use a playful font like Comic Sans for a child’s birthday announcement or cartoon, and use Papyrus on an invitation to an Egyptian-themed party. Stick with serif and sans-serif fonts for text heavy projects like newsletters. Sans-serifs are utilized for the web. Use the appropriate character style (bold, italic, underline, all caps) to create emphasis. Emphasizing a word or phrase requires only one style change. It is unnecessary to set text in bold, italics, and underline; instead select one style that is most appropriate. 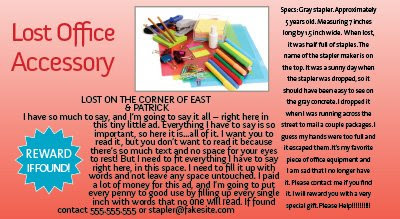 At the appropriate font size mentioned above, all caps can be very effective for setting a headline, or for calling out a word or two within your body text, but keep it to a minimum. When you over use a character style it doesn't draw attention, it competes for attention and decreases readability. Invitations and fancy announcements that have been set in all italic text or all cursive/script text are hard to read. Use italics and script fonts sparingly as accents or highlights to your over-all message. Text alignment is key! Flush left aligned text is the easiest to read and is the best choice in most instances. Flush right alignment should be used for short pieces of text, like a caption, call-out quote or margin note. When working with full-justified text, be mindful of word and letter spacing – large gaps between letters and words can become an issue. Centered text works well for invitations or short documents. Stick with one alignment style throughout your document for the most professional look. Most of all, keep your document or project consistent. An organized and consistent document will always appear more polished. Make sure the characteristics you choose for headers, subheads, body text, et cetera, remain constant throughout your entire project. At the end of the day, your newsletter, advertisement, or flyer should have great readability (reading ease) and consistent structure. Follow these basic guidelines, and you’ll be on your way to greatness.